Marshall Space Flight Center is testing a new robotic lunar lander test bed that will aid in the development of a new generation of multi-use landers for robotic space exploration. Thrusters guide the lander: one set controls the vehicle's attitude that directs the altitude and landing. On the test lander, an additional thruster offsets the effect of Earth’s gravity so that the other thrusters can operate as they would in a lunar environment. Flying a spacecraft on a planet with little or no atmospherepresents a definite technical challenge. Wings and propellers are useless, soNASA is practicing the art of flying by thruster on a prototype lander to touchdown on an air-less moon. "It's quite an engineering problem to solve. With ourtest bed, we're showing we can do it successfully," said engineer BrianMulac at NASA?s Marshall Space Flight Center in Huntsville, Ala. "All ittakes is practice, practice, practice. And of course, thrusters." This week, several teams of private individuals arecompeting for NASA prize money by test-flying their own mockmoon landers as part of the Northrop Grumman Lunar Lander Challenge. About $1.65million of a $2 million purse offered by NASA for the best mock moon lander intwo different challenges is up for grabs. Some of the award money has alreadybeen won, with two teams ? Texas-based Armadillo Aerospace and California?s Masten Space Systems ? competing for the $1 million first prize. Armadillo Aerospace has already qualified for the top prizeand won first place in a smaller competition last year. 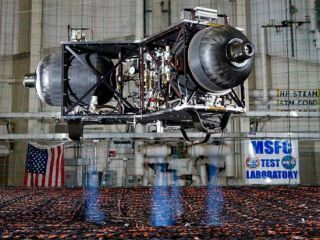 Masten Space Systemshas qualified for second prize in the smaller contest and is hoping to snarethe $1 million top prize during a series of flight tests slated for today andThursday. That competition, however, is separate from the work Mulacand his team are doing. The NASA researchers are conducting the tests incollaboration with other engineers from NASA, the John Hopkins UniversityApplied Physics Laboratory, and the Von Braun Center for Science and Innovationin Huntsville. They have outfitted their lunar landerwith four nozzles that release compressed air, acting as a force against theground to push the vehicle up. The thrusters release a flow of air that appearselectric-blue as it shoots out of the lander. "They look blue in this photo because the cold aircoming out of the thrusters is interacting with our 'nice' Alabamahumidity," Mulac explained. "The plumesare like miniature clouds. They contain ice crystals that scatter bluelight." To simulate what it will be like for a lander on the moon,where the gravity is much weaker ? about one-sixth that on Earth ? the teambuilt in a fifth, large thruster. The force from this nozzle effectivelycancels out most of Earth's gravity, making it easier for the mocklunar lander to push off against the ground, as it would be on the moon. The mock-up allows engineers to test not just lunarlocomotion, but also the systems humans will use to remotely operate a landeronce it reaches our celestial satellite. "We'revalidating the guidance, navigation, and control system needed for a successfullunar landing," said engineer Danny Harris. Though the lander is pretty tame, the engineers haveinstalled a net around its practice playground - visible in the background ofthe picture - just in case it got out of control. "That never happens," Mulac said. The team hopes the work they do could lend itself not justto future moon trips, but perhaps to landers on otherplanets as well. "By conducting these tests, we gain an appreciation forthe design of missions that land on airless bodies," said NASA planetaryscientist Barbara Cohen. "Many scientifically interesting places in thesolar system are airless. Besides the moon, we'd like to visit Mercury,asteroids, Europa and other airless destinations. What we learn here could havea broad application."